Posted on 03/22/2018 by Mickey McCarter	in Live Review and tagged Black Cat, Montreal, Ought, post-punk, Tim Darcy. Montreal-based post-punks Ought released Room Inside the World, their third full-length album, via Merge Records last month. The guys are on a world tour, which stops tonight, March 22, in Portland Oregon. They perform locally at Black Cat on Wednesday, April 4. Frontman Tim Darcy and company took inspiration from Brian Eno and Stereolab as well as The Mekons’ 1985 album Fear and Whiskey, among other stimuli. “The process of everybody wading into each other’s subconscious was really excellent,” Tim said of the writing process. 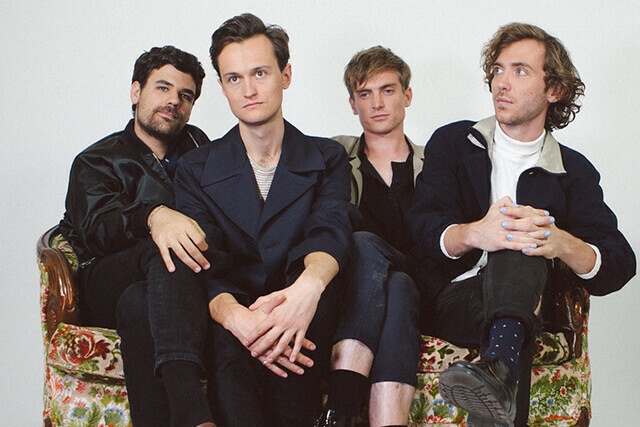 Instead of asking us to be introspective, as they did on their debut album, More Than Any Other Day, Ought now ask us to engage with the world around us and to knock down those barriers that separate us. In doing so, the band creates an album that is “Ought’s most beautiful — yes, beautiful — album to date,” said Lee Adcock for Drowned in Sound. Bonus: One of the openers is Priests’ Katie Alice Greer, performing as her solo electronic disco act, KAG. (KAG is no longer on the bill.) Buy your tickets online.